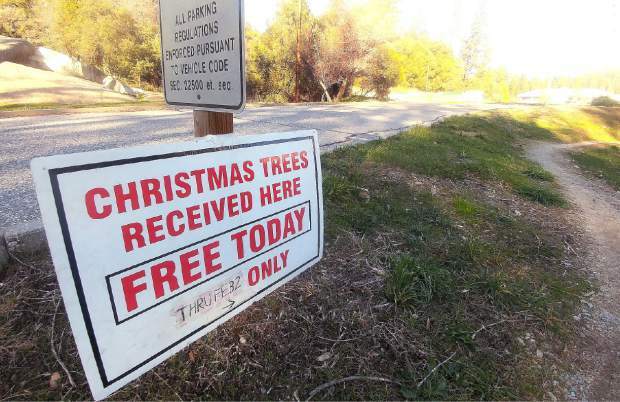 Signs point the way for a free Christmas tree disposal at the Eric Rood Administrative Center. Nevada County residents have a handful of ways to easily dispose of their Christmas trees. People have two locations where they can drop off their trees through Jan. 31. The McCourtney Road Transfer Station, 14741 Wolf Mountain Road, Grass Valley, is open from 8 a.m. to 3:30 p.m. Wednesday through Sunday. People also can leave their trees in a collection bin at the Cement Hill Road entrance to the Eric Rood Administrative Center, 950 Maidu Ave., Nevada City. “This is part of our contract with Waste Management,” said Trisha Tillotson, director of the county’s Public Works Department. There are three other spots that will accept trees only between 9 a.m. and 3 p.m. Jan. 6. Those locations are the Lake Wildwood Wastewater Treatment Plant, 12622 Pleasant Valley Road, Penn Valley; the Lake of the Pines Wastewater Treatment Plant, 10903 Riata Way; and the Alta Sierra fire station, 11833 Tammy Way. Those with green waste collection service can dispose of their trees in their carts, though the trees must be cut to fit and have no ornaments, lights or metal stands. Waste Management keeps no records about the number of trees it collects. However, last year people filled multiple collection bins, Tillotson said.